Toddlers LOVE to play outdoors and summer is the perfect time to let them get out there and do what they do best. However, they can also get bored very quickly! 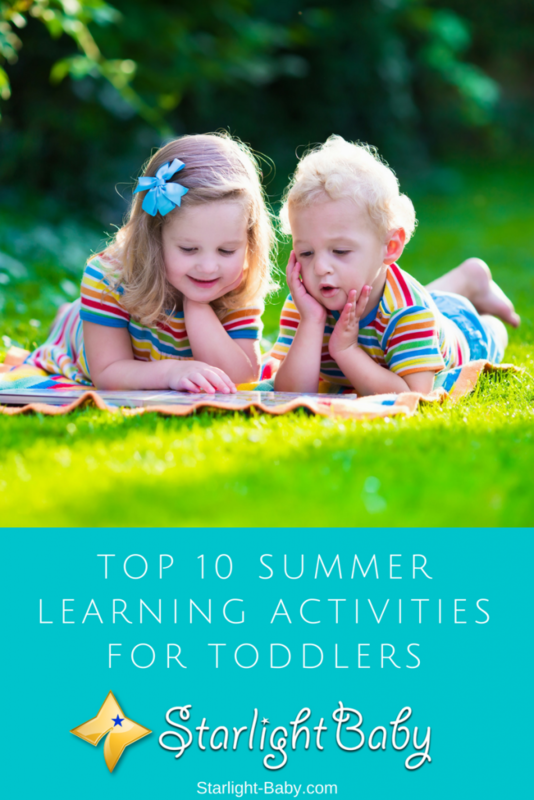 So, if you’re looking to help your little one make the most of the hot summer weather, here you’ll discover the top 10 summer learning activities for toddlers, many of which can be done at home. Your toddler will have hours of fun with their very own lemonade stand. This timeless idea is still just as enjoyable for kids today as it ever has been. You don’t need to spend a fortune setting up a fancy stall, some cardboard boxes, paper money and fake lemonade is all you need to get started. By “running” their own stand, your little one can learn more about numbers, money and the basic process of buying and selling. You can pay them with fake money, and in exchange they give you a plastic, “fake” cup of lemonade. Make it even more educational by asking them questions about the transaction. For example, you could ask “how much is your lemonade” or “If I give you $10 how much change will I receive?”. Obviously, the questions will need to be tailored to fit your child’s age, but this is definitely one of the best educational summer ideas that your toddler is sure to love. Painting is one of the best activities for toddlers as it’s messy, colorful and fun. However, painting indoors can get a little tedious, so why not do it on the patio? Now, we’re not talking about painting the actual patio here (though you could if you invest in some washable paint!). Instead, you’ll want some kind of mirrored surface such as a tray, or a safety mirror. It’s also worth stocking up on some tempera cakes to use as the paint, and be sure to have some cups of water available too. Let your toddler use their hands to mix together two colors of paint. This fun activity can be used to teach them about primary and secondary colors. They’ll be amazed as the two colors they use turn into a completely different color right in front of their eyes! Another thing toddlers are very fond of is nature. Why not bring them closer to nature by helping them create a DIY birdfeeder? It’s a lot simpler than you might think, and for younger toddlers you can simply invest in some pre-made bird seed feeders. Then, all your little one needs to do is choose a nice ribbon for the food to hang on and then watch from the window as the feed attracts lots of different birds. If your toddler is a little older, you can create your own bird food treats. You’ll need either suet or cooking fat, some seed and you could even throw in a little chopped fruit or cheese if you want to. Mix it all together, add a ribbon or place it into an empty coconut half and leave it to cool in order to set. Then, simply hang it and wait for the birds to come. When it does start attracting birds, you can use it as a learning opportunity for your toddler. Point out the different birds and their names. Talk about the colors of the birds and what they like to eat. Your toddler will love this activity and it’s something that can be done all year round. The only thing to point out here is if you are using fat to make the birdfeed, it’s important to ensure the grease is fully absorbed. If birds get the grease onto their feathers, they won’t be able to insulate themselves or absorb water properly. Building a bird house together is a great supplemental activity to this one, and there are plenty of children’s bird house kits available to buy. This is a fantastic idea if you’re heading to the beach this summer. Firstly, set a task for your toddler to find as many shells as they can. Then, once you get them home, you can use them to play a shell matching game. The great thing about this game is it can be played many times throughout the summer months. Simply get your toddler to pick out at least two of the same type of shells and place them to one side. Then ask them to find another pair of shells. If you have quite a good collection, you can also get them to find all of the same type of shell and place them into a pile. Add the names of the shells too if you want to make it really educational (though you may need to research these yourself if your knowledge of shells is fairly limited). If you don’t live near a beach, this game can also be done with different kinds of rocks. This fun and inventive game is sure to bring excitement to your toddler’s day! It involves a little graph filled with common sounds you’re likely to hear in your neighborhood. The goal is to listen out for the sounds and when your toddler hears them, they earn a star which is placed beside the written sound. If they manage to earn all of the stars for each sound, they could then be rewarded with a treat of some kind. You can do this activity practically anywhere and simply alter the list of sounds you’re likely to hear depending upon where it is being played. This sensory experience is both fun and educational and teaches your toddler not just about the different sounds around them, but also to concentrate and listen out for the sounds. Here’s another great seashell summer idea – seashell crafts. The great thing about using seashells is the fact they’re absolutely free. As mentioned earlier, you also get a two-in one summer activity as you can go out and search for shells one day, then use them in a craft activity another day. There’s all kinds of fun seashell related crafts you and your toddler can do. They can be painted, strung up on a string, turned into necklaces, or even simply stacked to help your little one discover more about numbers. Technology has really taken over in the past decade and these days kids are more likely to play on a tablet than they are to use their imaginations. Imaginary play is vital for your toddler’s development so why not encourage them to use this natural, vital skill by creating an ocean box? You’ll need a deep plastic tray, some plastic sea animals, a water pitcher, towels if doing the activity indoors, and decorative pebbles. Simply fill half of the tray with water, then add the pebbles and the sea animals. Your toddler can then play with these animals, having fun splashing and making up their own little scenarios. Make it more educational by telling them about the different animals in the ocean. You’ll be surprised how fascinated your toddler is by the different sea animals, what they eat and how they live. You may not be a huge bug fan, but you can bet your toddler is! Bug hunts are a great way to not only keep your little one busy, but to help them learn more about the different bugs lurking around the yard. There are a few ways to make this activity as educational as possible. You could help your toddler count how many different types of bugs there are. You can also teach them more about each type of bug they find. Don’t be surprised if your little bundle of joy sneaks a few bugs into their pockets! Many parents have been horrified to find bugs scattered around the home after their toddler has been on a bug hunt. So, don’t forget to check them before they go back indoors. A weather station is a great way to teach toddlers more about science. It’s inexpensive to make one and is likely to generate a lot of interest each day from your toddler. You’ll need a cookie sheet, or some other magnetic surface, foam sheets, magnets, magnetic letters, a marker pen, glue and scissors. Draw weather symbols on the foam sheets, such as rain, sun and clouds. Then, after cutting them out, stick the small magnets onto the back of them using the glue. Use the magnetic letters to spell out the word “weather” on the cookie sheet. Once this is set up, each day you can get your toddler to look out of the window to see what the weather is like. You can then choose the appropriate foam symbol and stick it onto the tray. This alone is a fun and educational activity, but you can also talk a little about the different types of weather too and start to ask your toddler questions once they’ve got the hang of the different symbols. All toddlers love creating stuff with playdough and this unique craft idea has one major advantage – it helps to calm your toddler down. Lavender scented playdough releases a relaxing, gorgeous scent that will instantly work to relax your little one as they play. This is an especially great activity to use either when your toddler is being especially difficult, or right before bed to help them drift off to sleep. It’s simple enough to make your own, but to make it easier you can add a little lavender scent to pre-created playdough. Overall, there’s so many fun activities your toddler can do throughout the hot summer months. The above are just 10 great ideas you can use as inspiration. Have any ideas you’d like to share? We’d love to hear them as well! These are very creative ways to entertain a toddler. It also looks like great bonding time. Wow, that’s a great list of learning activities. I like how they all in some way, more or less, involve the nature and being outside! I have to try the bug hunt, it sounds fun. We have actually made one of these DIY bird feeders before. I really thought that it would be hard and take an awfully long time but it was the opposite. It was rather fast and extremely entertaining because me, my partner and my toddler were all involved. We built it together and now it’s on one of our apple trees. Whenever we watch birds eat from it, I tell my boy if he remembers how we made it together. It is a wonderful memory and I recommend that everybody tries it. Sounds like you really had a great time bonding with your toddler and husband, Jane. Great to know! It is said that moments like this become etched in a child’s memory forever. It would be one of the best memories your child will remember of his childhood. Really appreciate your effort to put these activities together and explain them, but it would really be great if you could make some “how to” pictures to elaborate these activities more, it will make it a lot easier to learn these then. I have a 6 month old boy, do you have a suggestion on which one should I go with first for him? Hi, Rana! Thank you for your suggestion regarding the “how to’s”. It’s really nice to know you have a keen interest to spend time with your boy. I’m sure he would treasure it. Since he is still young, I believe the Sound Safari will be a fun learning experience for him. He will be thrilled to hear different sounds. The best thing about it is that it doesn’t involve any small parts that he could accidentally ingest. Cool and creative ways to encourage learning for toddlers. There is a whole lot fun that comes in creating DIY bird feeders and other projects. One good thing with this project is that, about 90% of the materials are easily accessible at home. You’re spot on there, Dparagon. These activities require materials that are found at home so they’re fun and cheap at the same time. And yes, it would spark their creativity so make sure you let them help when making the projects. It’s another way to get them busy, and will tire them out for a much needed nap time for both of you. Great ideas as always. I particularly liked that sound identifying activity and the reward that will follow. May be if there were many kids this activity would make it more competitive. If you don’t have any items to make stuff, here are some ideas for playing without stuff. Toddlers always love to play peekaboo or hide and seek. You hide behind a couch and keep quiet for some few seconds and spring out smiling. It makes them squeal in delight! You can also teach them how to dance. You will be surprised at how fast a child will imitate movements. Toddlers are very attentive when it comes to play. They want to watch you and learn and do exactly what you do. So you can teach your toddler the swing round motion. You put your legs slightly apart, your hands on your waist and swing round gently or move from side to side. You toddler will follow suit quickly and do exactly as you. Wow, all these ideas are great for keeping our kids busy this summer. I like the seashell craft and the bug hunt, I don’t agree with paint because as you say is really messy and I just painted my house, if you know what I mean? All the other are great Ideas, and I would add a tent camping, I think this is fun, and give them a private place where we cannot participate! Seeing all these posts now is quite timely because I’m sure going to divert from the norm of playing chess,visiting the normal sites and doing the exact same things. yea,varieties is the spice of life.going to try all of these and I know the little ones would be so excited about these. Summer is almost gone and my baby is too young to learn these things (he is just four months now). However, in the next summer, my baby will become a toddler and it will be time for us to teach him through fun activities. I really liked the ideas presented in this article. I will be trying bird feeder and bug hunt. I will also like to add few more learning activities such as watering plants, planting seeds and saplings, creating a fish pond etc. Painting is among the favorite engagement I love getting my little ones into, even though they make a very huge mess with the paints, they actually produce a good creative work from all the painting mess. There is a painting board in my home today that was done very long time, but the beauty of it made me keep it till date. Also bug hunts is thrilling but care must be taken so as to prevent them from getting bitten by harmful bugs. They basically seek out the bugs and the parent helps pick them and put it in a jar. Summer is here again. My baby has now officially entered the toddler stage. He has started to use few words, he even takes a few baby steps. In a week or so, I expect him to speak more and walk more. When my baby is able to walk, run, speak, listen, there will be a lot of work to do, especially helping him learn life skills and teach him what is safe and what is not. I live in a farm and my baby is interested in farm animals. I hope to teach him about different animals and how they help us.